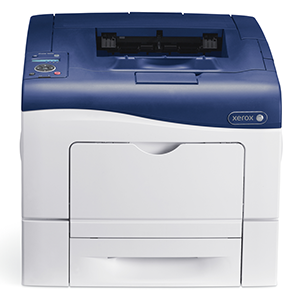 The Xerox Phaser 6600VDN single-function colour laser printer is great for small businesses. It prints quickly and efficiently in colour or black. Special features like earth-conscious settings and advanced image options set it apart from other printers. It would be fantastic to see this printer increase its standard resolution for even clearer image quality. The Xerox 6600VDN weighs 25.5 kg and has dimensions of 430 x 488 x 384 mm. The design is visually appealing with a cube shape and wave design on top where you will find the display, buttons and paper output. The Xerox Phaser 6600VDN offers an impressive duty cycle of 80,000 images per month. It also prints quickly at up to 35 ppm for both colour and black. Print resolution is up to 1200 x 1200 dpi with enhanced image quality. This printer warms up more quickly from power-saving mode and prints the first page faster than other models. The amount of productivity for the physical size is quite impressive. Advanced features like settings for photo, colour calibration, watermarks, and eco-conscious aspects make this a specialized and efficient printer. This printer allows for two-sided printing, which saves both paper and money. This features increases the cost of this version of the printer slightly, but two-sided printing might save money with long term use. Unfortunately, the Xerox Phaser 6600VDN could use a slight increase in standard print resolution. This would be especially complementary to the advanced image and colour options offered by this printer. In standard mode, it only prints at 600 x 600 dpi. Luckily, enhanced image quality allows for printing at up to 1200 x 1200 dpi. This printer does include network connectivity but does not include wireless connectivity. Wireless connectivity is available in other versions of this printer.